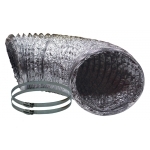 Flexible ducting is perfect for routing the ventilation system too or from your Grow Room. Reinforced flexible aluminium ducting keeps moisture inside and takes the air to where you want it. A very stong aluminium ducting with a strong steel wire spiraled internal frame. Where noise is not an issue, this is a very cost effective solution. Manufactured to strict European regulations tomeet all safety standards.